Ho-Hum, last week I dropped my iPhone 4 and it had to go buh-bye. Although I had known that I was going to get a 5 soon (I mean, I did order Everpurse for a 5 when I had a 4) I wasn't ready just yet, I was on my way out from work and was going to by a new purse (#FAIL because I couldn't justify buying a bag when I knew I had to buy a phone). On the plus side, I have a new phone (yay), BUT what happens to your phone accessories when you get a new phone? I have had book iPhone cases, wood iPhone cases, this book iPhone dock - you name it, I think I have owned it! Most recently, I bought the Pantone Universe 418 (my bday!) case, and I have had the No. 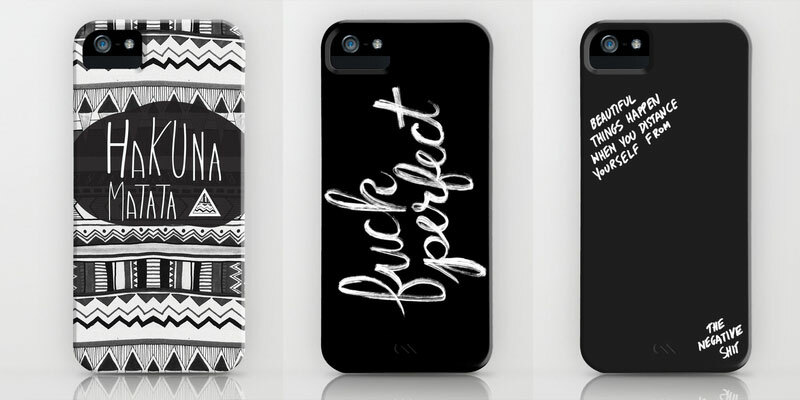 2 case above - so my natural instinct would have been to get the Ampersand by the same artist (I have been eyeing that baby for a while) or another Pantone case (the Pantomime Vegan Power is kind of awesome)- but have you seen all the cases on Society6?! I spent most of my Sunday evening looking through and here are some of my favs- you have to help me choose! Who doesn't love some Helvetica? - I kind of lurve this Neue&Impreuved case. The designer in me says YES! buttttt- YELLOW SUBMARINE? 128johnst is named after the address of my Aunt K. who was beyond obsessed with the Beatles, and my background hasn't been anything but a Beatles image since she passed soooo.... but then l saw this adorable Little Escher's Building Blocks! So simple and well done! Ya'll know I am into pattern. All-Day-Er-Day-Pattern, so when I saw some of these beauts I fell hard. Native Song, Bulgarian Rhapsody and DG Aztec have me swooning, hard. BUT WE DIDN'T EVEN TALK ABOUT THE HAND WRITING ONES YET! The Hakuna Matata is a combo of pattern AND hadwriting, I think she takes the lead... but holey-moles, look at those other, simple, B&W, handwriting options. The F perfect and Beautiful Things really are making this decision difficult on me! So whats the leader from this bunch? I just can't decide! Help!